Today's marketing tip can be connected to last week's tip regarding the Google URL Builder. 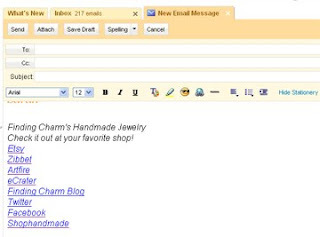 Be sure to have links to all your shops and websites where your items are posted in your email signature. See my example below. Be sure to create dedicated URL's for each link so you know where some of your web traffic is coming from. Each of my links has it's own URL, with the word 'email' in it. That way I know when someone has clicked when they received my email directly or through a forward. Your email signature should be set to be inserted in everything that you do in your email, from new messages to forwards. We all know how email forwards run rampant. Be sure to include your links in these forwards. I even erase all the other contact info that's been left in the forward to make sure my email signature stands out. This really works! Whenever I need a 'pickme up', I'll go to Woolcrazy. I just love her owls' adorable faces. They make me smile. I'm in love! It's hard to pick a favorite one, so all of them are my favorites. I also like her other critters like the bunny, penguins and the chick. I had no idea you could do all that with fibers. It's an enviable talent. One of her cuddly penguins, Percy, goes on fabulous adventures. You can follow Percy on Twitter and also read about his travels. I hope one day, I'll run into Percy. Woolcrazy is also good at posting videos she comes across for felted wool projects and other crafting projects. So not only does she felt the critters, she also is informative. I also like that she is environmentally sound and uses recycled fibers as well in her creations. 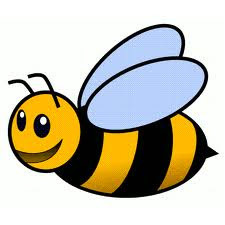 Please become a fan on Facebook of Woolcrazy with me. You'll have a blast. I believe your eyeglass leash/holder should show off your personality. I created this eyeglass leash/holder from a set of beads that I bought that weren't quite right when I started putting something together. So instead, I had some bugle beads that just happened to match perfectly! It was meant to be. 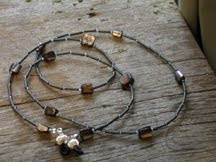 A simple eyeglass holder made of brown shells and shimmering green/brown bugle beads divided by silver glass beads. Shell eyeglass holder measures 27 inches. Silver holders are used at the end. I use this tool all the time and it's super easy to use. 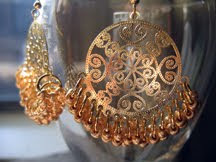 Many of us Etsy Shop owners use Google Analytics as it comes easily with Etsy. Want to know how a certain campaign did or want to know the amount of clicks you get from an ad online? 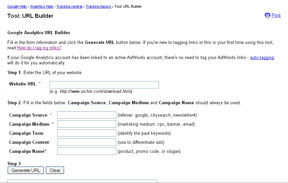 You can track that using the Google URL Builder. I recommend you open this page in another tab or browser window so you can read and look back between the two so you can get a feel for this process. All you have to do is fill in the url you want the click to go to (you can also use the shortened tweet links as well, they'll go to wherever you shortened it from) Source, Medium and Campaign Name. I suggest you put the Source and Medium in the Campaign Name. It makes for easy check when logged in to Google Analytics to check it out. All this information is automatically linked to your Google Analytics account. You will not need to enter anything into your Google Analytics. to send to the company that will be displaying your ad. URL for the shampoo page (ie: www.imakesoaps.com/shampoos) / Source=etsy_stalker Medium=tile_ad Campaign=etsy_stalker_tile_ad_shampoo. 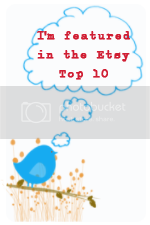 Click on Generate URL and copy and paste this link and send to Etsy Stalker. Please note! If you want to tweet a URL Builder link, you can still use the bit.ly address shortners and it will not change the campaign in any way. These links will be lengthy to tweet. Infact, I'll be tweeting this and you'll be counted if you're reading this. Now you want to see how it's doing. After 24 hours (Google does not display real time stats) of placing the ad or after your ad has been running, you'll go to your Google Analytics and go to the "Traffic Sources" on the left side of the page, click it. That will populate a list. Go to "Campaigns", click it. Here you will find a list of campaigns. There will be several of which you did not place, I have not been able to locate where some of them come from. I can only assume Etsy, Facebook, Twitter or other resources you may be involved in. It's something they do. But you'll look through the list and find how your ad did or is doing. Look for the Campaign Name: etsy_stalker_tile_ad_shampoo. You'll see the number of clicks it received. I use this tool for ads I place online, blog entries that I'll tweet or place on Facebook, and anything else I feel is worthy of knowing how exactly something is doing. I hope you find this helpful. Please let me know if you have any questions. This Tennessee gal is a herb growing, butter whipping, salve making selling machine, so that means her products are that good! She has a loyal customer base and I'm happy to say I've joined that group. I have her Bulgarian Rose Whipped Butter. I live in a drier climate now then I'm used to and it's played havoc on my skin. Within just a few days of using the butter, my skin was going back to normal and also smelling really good. I like that on her Etsy shop her headline is 'Affordable Luxury in Handmade Skin Care' and that is so true. From my tweets with her and the quality product, I can tell she is passionate and proud of what she does. You have a chance to sample some of her products in a double giveaway she is having. Visit her blog for details on how you can enter to win. I'm so excited to share with you my feature in Jenjie's Crafty Stuff's Valentine's Day Gift Guide. She spotlighted my Red and Black Bracelet ... Made with Silk Beads. Also featured are other great gift ideas such as charms that are just too good to eat, delicate headband, and other great treasures. Please go and check out her Valentine Gift Guide on her blog. I think this is a unique set. I like the square 3D blocks and the contrast of colors. I created this from an inspiration from a friend. 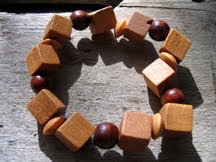 She loves wood jewelry. The honey color pops next to the cherry stain of the round wooden balls. It's a fun piece that I'm sure will get many compliments for it's new owner...whoever she may be. 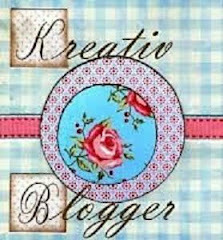 I want to thank Capricorn One Vintage for awarding me the Kreativ Blogger Award. 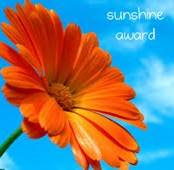 Capricorn One Vintage (COV) received this award from the Riddle blog. COV is paying it forward. 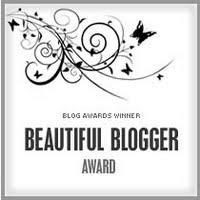 She has chosen seven other fine bloggers to give this award to. Me being one of them, it is now my turn to pay it forward. Rules of course have been applied. After copying the award from COV's blog, I now have to write 7 things about me you may not know. Then pick 7 other fine bloggers to give the Kreativ Blogger with links to their blogs. I will be letting them know they've been chosen. Here are 7 things you may not know about me. 1. I do a community service project every month. 2. I'm crazy about the zoo. 3. I have been a nanny for 6 kids, whom I call my '6 pack'. I still keep in touch with them. 15,14,13,11,9,7. We've travelled the world together and I was fortunate enough to be with all of them since they were babies. 5. I'm not one for chocolate, but put cream cheese frosting on it and I'm there. 6. I paid for college by myself. 7. I name all my cars. The car I have now is my first boy car. His name is Gus. He's a Pontiac Aztek. It just seemed to fit. I love my Gus. I've had Cherry Blossom and Jade before. Have you signed up for Twillypop's Giveaway? Better hurry, ends January 24th. This is my first in my Sunday Marketing Tips of the Week. This week I'm going to start with something I learned this week in the Etsy forums. It's something quick and easy. Did you know if you change your shop announcement, that moves your shop up to the top in the local searches? You can just change an exclamation point and it's considered a change. I recommend you change your shop announcement every morning or lunch time, whatever works for you. It'll take just a minute. Feel free to comment/share your tips as well. My first crafter to feature in my blog is Capricorn One Vintage. She was supportive of my blog by being the first to follow. Many reasons come to mind as to why I like to keep track of this fine lady. One, she collects and sells antique, vintage things from 1900-1980. I have a soft spot for antiques. I love that her findings range from jewelry, vintage graphics to lingerie. There is something for everyone in her shop. I particularly love her Flickr photostream. Cool things that brought back memories from when I was a kid like old Safeway grocery pictures and graphics. Kansas City no longer has Safeways and now that I'm in Dallas, I haven't found one yet here either. Remember the old metal spice boxes? She's a got a collection of those too. Maybe some of them posted are from my childhood kitchen. You can find a lot of graphics and old magazine ads. Those I like because I am in marketing and find them entertaining. And if you are a photo collector, she's got quite an assortment. Another great reason to keep tabs on Capricorn One Vintage is that she's great to follow and chat with on Twitter. I know with her it'll be more than just a couple of tweets back and forth. She's genuinely interested and is supportive by retweeting. I encourage you to visit Capricorn One Vintage. Find your little bit of vintage and take a walk down memory lane. You'll want to go back for more. I think this necklace is pretty cool. I got the inspiration at a little jewelry shop on Harry Hines here in Dallas. I added my own special crystals and quite frankly, better made. I used memory wire to make the loops. The pearls have a shimmer shine to them. It's a fun necklace that I'm sure is to catch anyone's eye. This is a unique necklace made of golden and brown tone pearls. Peach crystals are spaced between the gold beads. 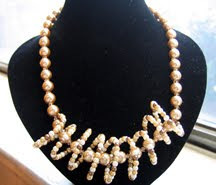 The twisted strand of pearls are gold, white, ivory and brown. The necklace measures about 20 inches. A toggle clasp is used. Late last night during a conversation on Cafehandmade, I decided I would share marketing tips with my fellow crafters. There were a few new sellers, including myself, struggling to find the right fit. It's a big world out there in handmade. I am a marketing manager by profession and have worked in business to consumer marketing and also business to business. I hope I will be able to help everyone out who follows. Please feel free to ask me questions and I'll answer them as soon as I can. It helps to learn from each other and even I learn from others. I'll be posting tips soon! Been busy creating this blog. And also updating all my photos to reflect the same background throughout all my shops. This is a slowly but surely endeavor. I hope it's done this week. The best part of it is the 100% computer time and catching up on The Big Bang Theory! So fun and makes this tedious task well worth it.